Practical and functional system coupling and quick release for Babystay with toggle quick pin at the bottom side. 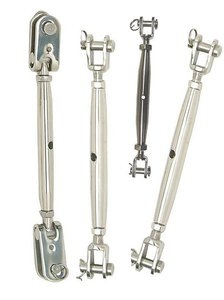 Sturdy turnbuckles made of stainless steel with precisely cut thread. A rigging screw is a fitting used to attach a cable to a fixed structure and to control its tension. These devices are used to tune sailboat rigging by adjusting the tension of forestays, shrouds and the backstays. These devices generally consist of a threaded cage which is turned to adjust the tension on a cable running to the deck. This cage can be open or closed. Hydraulic models, common on backstays, permit dynamic adjustments. Related fittings often used on sailing dinghies are simple and inexpensive channel adjusters or extenders. However, these are difficult to adjust while sailing. Choice will depend on the rigging screw's mechanical strength, its range of adjustment, weight and size.